Tuesday morning began with the prayer service for those prayer requests submitted earlier, as well as for the camp meetings taking place in Peru and around the world. After the prayer service, our souls were further blessed by Agustin Quiroz, the leader of the work in Peru, who with tears flowing down his face shared with us his desire that the Lord would develop more laborers for the work there. Though Brother Agustin continues to endure health challenges, he emphasized that rather than his body, it is the work that is his main concern. Brother Sam Ajayi, Director of South America Work, assured him that God is faithful and will deliver what He has promised. On Tuesday evening, we were blessed with two testimonies about how God called the two to salvation. One was from a brother in Peru who shared how God showed him in dreams that he should repent, and then while attending a church in Lima, the minister echoed the same message as his dreams, leading him to give his life to the Lord. The other testimony was from Josephine McElveen, pastor of our church in Washington D.C., who shared how even though she had been raised in a Christian home, while in Los Angeles, California, a minister asked her if she was saved and she realized that her upbringing was not enough, leading her to seek and receive salvation. Brother Sam delivered the message focusing on receiving salvation. After the altar call and time of prayer, many came up to be anointed and prayed for by the ministers. 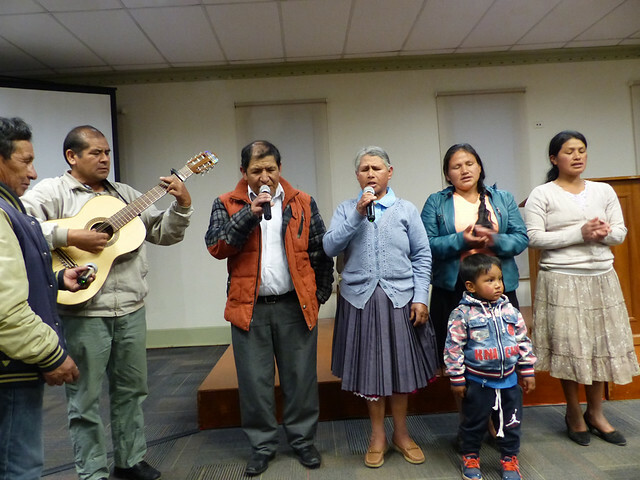 On Wednesday, during the prayer service in the morning, our souls continued to be blessed as several saints in the Cajamarca, Peru, area pressed their way to the prayer service despite the long distance. The evening service included two testimonies from saints at different churches in the Cajamarca area. A sister from our church in Combayo, Peru, shared how her baby was deathly ill. God healed the baby and this led her to give her life to Christ. The baby is now a young lady attending the Peru camp meeting. Another sister from our San Luis, Peru, church testified about how she and her family fasted for two days and God healed her of appendicitis. The message was on sanctification and we were instructed that salvation and sanctification are part of our spiritual foundation. As with the night before, after the service, more than a dozen patiently waited to be anointed with oil and prayed over by the ministers. We began Thursday morning with a prayer service thanking God for the blessings already granted during the camp meeting and praying for more to come. The Thursday evening service began with two songs led by a sister from the Cajamarca church. There were three testimonies. One was from Brother Sam’s wife, Shade Ajayi. She shared that she had a Muslim upbringing, but shortly after visiting an Apostolic Faith church with a classmate, she gave her life to Christ. Another testimony was from a brother whose father lived far away and whose mother was deceased. He had spent time in the bars and even considered suicide, but told himself that if there was a church service nearby, he would give his life to Christ. He attended a church service and God saved him. The third testimony was from Brother Agustin. He shared how after arriving for camp meeting on Sunday, he could not bend down due to pain from a herniated disk and was considering going back home. However, on Tuesday the ministers prayed for him and he could bend again. As a result, he was able to stay and enjoy more of the camp meeting. The message Thursday evening was on the third part of our spiritual foundation, the baptism of the Holy Ghost. Sister Josephine delivered the message, admonishing listeners to seek the baptism of the Holy Ghost because it provides power for service. But, in order to receive this power, we first must receive salvation and then sanctification. We were instructed that only after completing these two steps, would our hearts be ready to receive the baptism of the Holy Ghost. During the prayer service on Friday morning, Rogelio Ramos, the pastor from our church in Combayo shared that his daughter had been sick and was healed after coming forward to be anointed and prayed for after an evening service this camp meeting. Following the prayer service, those in attendance went out to distribute tracts in the surrounding neighborhood. For the evening service on Friday, three testimonies were shared. The first was from a sister who said she was in pain earlier in the week, but after prayer she is now much better. Another sister shared how God healed her from a severe sickness where she could not eat or drink for fifteen days. The last testimony was from Corey McElveen of Chicago, Illinois. He shared how he was first saved when very young, but strayed from God when he left home for college. Thankfully, God never strayed from him. He recommitted himself to Christ, and the Lord has been strengthening him ever since. God provided him with a supportive church family and a Spirit-filled wife to serve the Lord with. Friday evening´s message was the final teaching and encapsulated what was taught throughout the camp meeting. Brother Sam instructed us that we have direct access to God to make use of all we have learned on how to build our spiritual foundation with salvation, sanctification, and the baptism of the Holy Ghost. The final two days of the 2018 Peru camp meeting were filled with clear examples of how God is blessing the work here. On Saturday morning, about fifteen from the congregation traveled to the San Luis church, which is currently under construction. The trip took over two hours, on mostly unpaved roads winding up and around the sides of the Andes Mountains. Those who had never taken the trip were amazed at how arduous a journey the saints from San Luis had undertaken each night to attend the camp meeting! Upon arrival, the pastor, Severino Marcelo, led a tour of the building and adjacent property. The capacity of the building appeared to be about one hundred. The exterior has been completed and the interior is expected to be finished by next year’s camp meeting. Lord willing, the dedication will be held then. Our visit ended with a prayer for the church that God would help in completing it. The next morning, Sunday school was held at our Espina Amarilla church where Aureliano Quispe is the pastor. The saints at Espina Amarilla had not been able to attend the camp meeting due to illness, so they were overjoyed that we brought some of the camp meeting blessings to them. With a van and car load, there were roughly twenty who made the two-hour journey to Espina Amarilla, located in a remote village in the Andes Mountains. Upon arrival, we could hear the saints praying inside. The Spirit of the Lord was already there! The Sunday school lesson, “Used of God,” was taught by Eladio Retemal, pastor of the church in Limavida, Chile. Afterward, during the morning service, Brother Sam congratulated the saints at Espina Amarilla on the beautifications made to the church since his last visit. These included tile flooring and a painted wall. The message was taken from Psalm 19:9-10. We were reminded that through salvation, God has given us a gold mine of blessing that is ours to claim and keep. A session of spirited prayer followed. Afterward, we were treated to a delicious, traditional Peruvian meal prepared by the sisters at the Espina Amarilla church. The final service for this year´s camp meeting was the Sunday evening ordinance service. A sister from the Cajamarca church led the congregation in two song selections, and then a sister from the San Luis church led in another. Brother Rogelio delivered the message on the Lord’s Supper. Due to limited facility space, we did not observe the Foot Washing ordinance. In closing remarks, Brother Sam challenged us to return to next year´s camp meeting spiritually stronger than we were this year, if the Lord should tarry. Brother Agustin provided the closing prayer. Afterward, the entire congregation gathered for a group picture, enjoyed a time of fellowship, and wished each other well in their journeys home and until we meet again. The Lord tremendously blessed the camp meeting. We heard reports of salvation and healing. We all feel revived and are thankful to be privileged to be a part of it. Should the Lord tarry, the 2019 Peru camp meeting has been set for July 28 through August 4.